Male facials are just one popular spa treatment targeted to treat male skin concerns. Men today are well aware of the importance of a good regimen to keep skin healthy, balanced, maintain a good appearance, and improve the complexions quality. 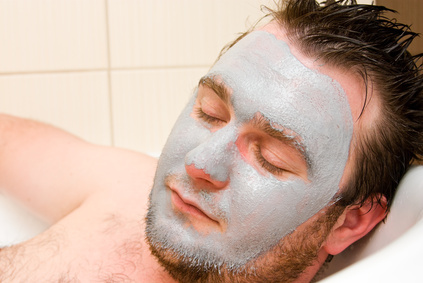 More men are realizing the benefits of facial masks, plus the relaxation it brings. Treatments for both men and women can address very similar needs such as acne, wrinkles and other anti aging issues. Guys also have a variety of their own type of stresses when it comes to shaving. Facials can also help ease shaving irritation, redness, and combat ingrown hairs. Determine your skin type to ensure the best mask is selected for the greatest benefits. Acne is often a concern on other parts of the body. Specialized facials can be very useful to control acne on other areas of the body such as the shoulders and back. Mud and clay type masks help draw dirt, toxins, and impurities from the deeper pores to the surface. A facial mud mask will also tame shininess,and absorb excess sebum and grease, reducing inflammation. Clay is a good choice to help clarify problem psoriaris and common, troublesome conditions such as oily and acne prone skin. Mud masks are more intended for dry types, adding moisture, they also help open up pores, clear up blemishes, and improve circulation. A perfect remedy for dry, flaky, or mature types to help restore and add deep hydration to the epidermis. These rich masks are ideal for plumping up the tissue, firming, and replenishing the loss of moisture content, reducing the look of fine lines, wrinkles, and dull complexions. These luxurious masks are rejuvenating and nourishing, leaving your face smoother, vibrant, and a more youthful. This particular type is very beneficial to men that are more susceptible to the elements. Over time, free radical assault can do a great deal of damage and destroy elasticity and skin thickness. Treatments help dehydrated or sun damaged skin by soothing, restoring and protecting it from free radical attack. Exfoliating masks are designed to give a deep-down cleanse action to help resurface your complexion. They help extract and remove trapped, dead surface cells, grime, and impurities encouraging new collagen and elastin. Powerful cleansing improves circulation, stimulates the regeneration of new cells, and uncovers a more luminous, smooth and polished appearance. These highly advanced nutrient-rich facials provide a boost to aging skin. They are intended to replace essential moisture, tone, and restore the glow to dulled complexions. Many varieties are available that brighten, refresh and provide powerful anti-aging effects. All types benefit from these rich nourishing formulas that make them an ideal choice to address premature signs of aging. Some top shelf products offer active ingredients that stimulate cell growth and enhance the production of collagen fibers. Most peel off formulations are of a gel base that are peeled off when dry. These cooling, fun masks will help exfoliate your skin by adhering to dead layers of cells, oil, and blackheads. They dry to a peelable film, taking buildup away when removed, purifying and invigorating the complexion. Firming masks usually come in cream or gel form with special ingredients to strengthen the structure of the cells and increase elasticity. These specialized mask treatments are commonly used to lift, firm, smooth out wrinkles, and reduce the appearance of sagging. Combine all ingredients together and beat until foamy. Apply mixture evenly over face, and neck with fingertips, avoiding the eye/mouth area. Lie down and relax while the mask dries and tightens. Leave the mask dry for 15-20 minutes and rinse with warm water. Splash with a cold wash. Pat dry. Follow up with a moisturizer. All natural facial masks are made from natural ingredients, essential oils, and herbs. Homemade recipes can be personalized with your own special cocktail of ingredients and designed to suit your own needs, offering endless benefits. Many professional prepared formulas can be purchased or numerous homemade recipes are available for all types and personal needs. Adding male facials to your regimen will help you look and feel your best and can help you manage stress.